Instagram has always been very much a mobile-focused offering, though it’s true to say that in recent years the team has shown a little more love for the web version of the photo-sharing service. The latest feature that could be on its way to Instagram’s web interface is direct messaging. High-profile app researcher Jane Manchun Wong discovered this week that the Facebook-owned company is now conducting internal testing of private messaging for its website. If it goes live, Instagrammers will be able to send and receive direct messages via their desktop or laptop (or a mobile browser), giving the company a better chance of becoming the messaging service of choice for its community, which currently stands at more than a billion people globally. Wong’s grabbed images (below) were taken from the mobile version and show the screens where users would view and manage their private messages. In 2017, the company launched a standalone messaging app called Direct, which it’s still testing with its community in six countries. It’s not clear if a web version of messaging for Instagram will have any impact on the standalone app, whose ongoing failure to launch beyond half a dozen markets has left some wondering about its popularity. Launching direct messaging for Instagram on the web wouldn’t be such a big surprise. After all, soon after Facebook acquired WhatsApp in 2014, the messaging service launched a desktop version of its popular mobile app. And Facebook’s own messaging service, Messenger, has offered a web version of the service since 2015. Another sign that Facebook is doubling down on its messaging efforts came just last month with a New York Times report claiming the social networking behemoth is considering making major changes to the back-end of Facebook Messenger, WhatsApp, and Instagram that would allow users on those services to message each other regardless of the platform they’re on. 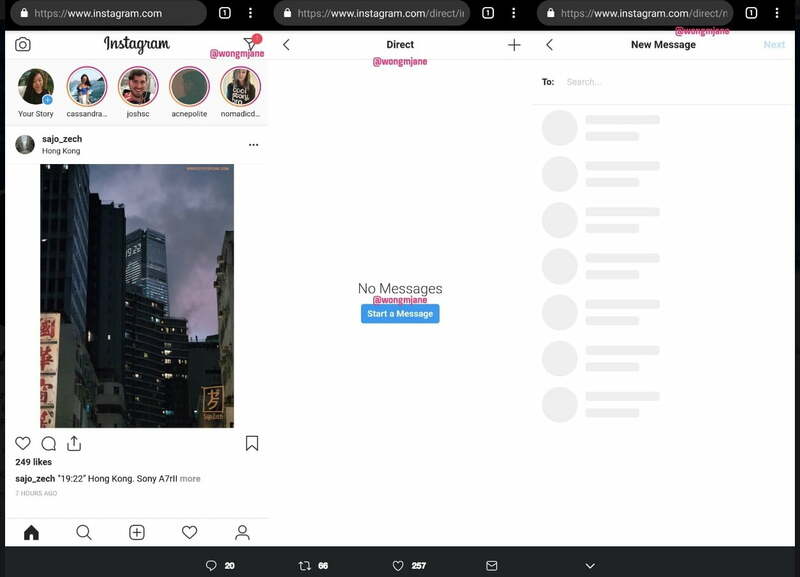 Taking Instagram’s direct messaging to the web would clearly be another step in making it easier for ‘grammers to reach their buddies, though it’s worth noting that at this stage it’s only a test and so there’s a chance it may never see the light of day. We’ll update if and when it lands.